Newcastle is a historic city with a vibrant industrial past. It has become today the forefront of technical innovation, leisure and culture. Newcastle is situated in the North East of England on the coast, and 1.5 hours south of Edinburgh. Newcastle is well served by the major roads in the UK. From the South the A1 or the A19, or from Carlisle the A69. For more detailed information the AA will be able to provide times and routes from your location. 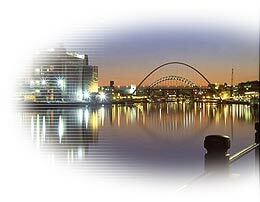 Newcastle has rapid access to the rest of the UK and Europe by means of a a busy international airport on the northern edge of the city providing links to most European capital cities. A fast rail connection to London (2 hours 45 minutes) and Edinburgh (1 hour 20 minutes). A busy coach station together with ferry services from nearby North Shields to Holland, Germany and Scandinavia. central station and Metro links to the University. Situated in the heart of Newcastle’s city centre, the Holiday Inn is within walking distance of the University and a short Taxi ride from the station. This modern hotel is well within walking distance of the Airport terminal and offers a large car park. Access to the University is via a convenient and direct Metro rail link to the Haymarket Metro Station. The Royal Station hotel is situated adjacent to the main Railway station and provides easy access to all of the main line and Metro rail links. The university is within 10 minutes walking distance from the hotel. The Swallow Imperial is located in Jesmond, a 10 minutes walk from the University. The hotel has comfortable rooms and offers a pool and other leisure facilities. There are a number of single study bedrooms all with wash hand basin and shared shower and bathroom facilities.